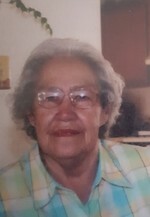 It is with deep sorrow and heavy hearts that we announce the passing of our loved one, Susana (Susie) Castillo, 89, of Hatch, NM. She went home to her final resting place on Saturday, February 02, 2019 at her daughters home surrounded by her loved ones. She was born on April 2, 1929 in Rodey, New Mexico to Santa Cruz and Juanita Garcia. She was a devoted Catholic, loving wife, mother, grandma and friend. She devoted her life to her family and her husband. Those left to mourn her passing include her five (5) children, Danny (Gaby); Bobby Castillo of Las Cruces; Gloria (David) Hernandez of Hatch; Terry (Andy) Apodaca, of Garfield; Michael (Lupe) Castillo of Hatch. Her 14 grandchildren, 21 great grandchildren, and 9 great-great grandchildren. She is also survived by her many nieces, nephews, friends, and cousins. She is preceded in death by her husband of 64 years Florentino (Tino) Castillo. Her parents; her brothers and her sisters. Visitation will be on Wednesday, February 6th, 2019 from 5:30-7:00 pm at Our Lord of Mercy Catholic Church in Hatch, New Mexico where a prayer vigil will follow at 7:00 pm. The Funeral Mass will be held on Thursday, February 7th at 10:00 am at the same church. The Rite of Committal will follow at the Garden of Memories in Hatch, New Mexico.